Our garbage can is usually about a quarter to half way full and our recycling can is always overflowing. So Aaron arranged to have our garbage can swapped out for a smaller one and an extra recycling can delivered too. Our two "new to us" cans appeared curbside today. Owen was so excited to help bring the new cans up to the side of our house. "It's just my size!" he announced in reference to the garbage can. 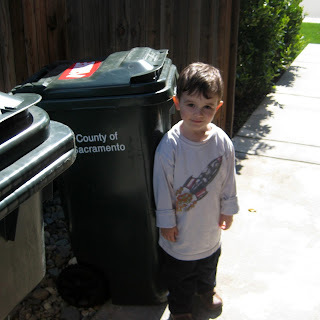 Owen and the garbage can - so cute I had to grab my camera out of my bag and take a video! appointment he checked out fine! a wall trying to stay out of someones way. A couple of weeks ago, at Owen's MY GYM class, the instructors had the kiddos jump on a mat with measurements in feet and inches printed on it. From a standing position, with his feet flat on the ground, Owen jumped forward a distance of 3 feet 3 inches! I was so impressed! The only problem with this video is that Owen is not allowed to jump on the couch - tisk tisk Daddy. Grandpa Bruce, Grandma Lia, and Uncle Treston came to visit us this weekend! 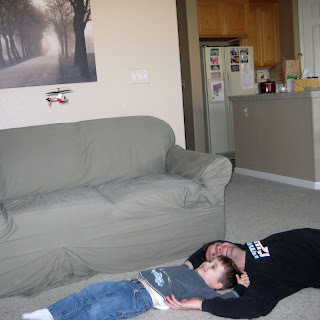 Grandpa Bruce brought a remote control helicopter and Owen was mesmerized. We also took advantage of the fleeting sunshine and went on an outing to the park. Owen & Daddy watching the helicopter. 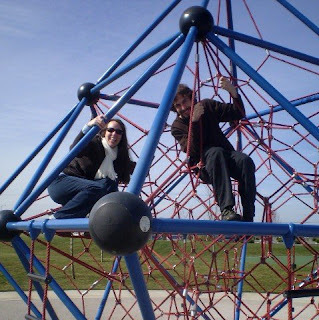 Kelly & Uncle Treston playing at the park. Saturday was a beautiful day. Cold, yes, but the sun was shining and the wind was not blowing! It was a great day for a run. We ran 2.25 miles today. It was a bit more challenging than I expected. Not being able to train during the week due to wet and windy weather is definitely catching up with me! I've decided that I am a fair weather runner! I guess I'll have to adjust my expectations for the upcoming race. I am a teeny bit competitive and would have liked to have done better than last time but ultimately whether I run faster, slower, or at the same pace I'm having tons of fun with my team mates! 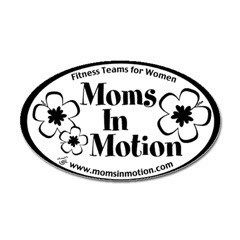 Go Moms! We were also able to take our team photo. Not everyone was able to be there. After a run three representatives from a company called Juice Plus had shakes and samples for us to try. 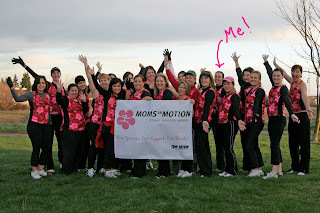 One of the reps, Leigh Hobson, is also the Lodi StrollerFit owner/instructor. She was super fun to talk to and very encouraging! She's been running for a little over a year now and recently completed her first half marathon. More exciting team news - We're putting together a fundraiser to help raise money and awareness for NADA. Now through March 15th we're collecting donations for a raffle. We've already received some great prizes! Soon we'll be selling raffle tickets - 1 for $1 or 12 for $10. The night of the race we'll be drawing tickets!! All items donated are tax deductible and all sales of raffle tickets will go to NADA! Here's a clip of Owen and his girly-girlfriends, Taylor and Hailey, putting on a puppet show! We all had dinner together the other night. The kiddos had so much fun playing together they almost didn't seem to notice that all of us parent types were even around. That is until Aly and I started throwing the word dessert back and forth! Suddenly, like jet planes, three little people came whooshing up to the counter! So cute! I love sweets, especially chocolate, and could easily subsist on them alone. I’ve read that the consumption of sweet treats spurs the appetite to grave more sweet treats. I believe this is true. I’m also an emotional eater. I remember as a new mother being bombarded in books and magazines with the expression “self soothe.” Babies have to learn to self soothe was the message. Well, I “self soothe” with sweets. When the going gets tough, the tough get chocolate! For these reasons when I choose to lay off sweets I prefer to go cold turkey – no chocolate, no sweets. Even the smallest taste releases the beast within me. By the time anyone reads this the evidence will be long gone! I thought I had made it through Valentine’s Day, the national holiday for chocolate consumption, when a package showed up in our mail box. I opened it to find a heart shaped box filled with See’s Candy. Hooray! My heart and taste buds soared – earlier that same day I had searched the pantry, refrigerator, freezer for something, anything sweet! Now, I’m not one of those dainty eaters. Women who eat just one piece every day or every other day, savoring it until the last piece is gone, oh no, that’s not me at all. Once I release the beast I must eat. Eat it all until it is gone. I wait until no one is around and devour the entire box or at least keep eating until I’m on the verge of feeling sick and then stop for awhile. It took two days. Soooo Good! 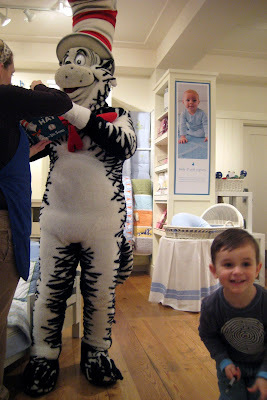 I had mixed feelings about attending this special story time at Pottery Barn Kids today. Taking Owen out in the rain and going to the mall on a holiday Monday is not my idea of a good time. 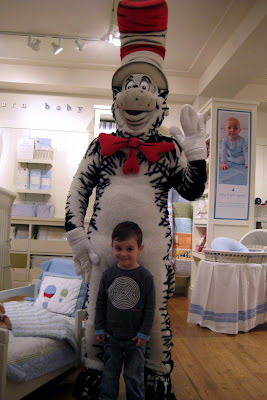 But Owen loves The Cat in The Hat and I figured I had a fifty - fifty chance he would think the whole thing was super neat or freak out at the sight of the Cat! I am soooo glad we went! We had a great time! All the kiddos and their parents were sweet and well-behaved. 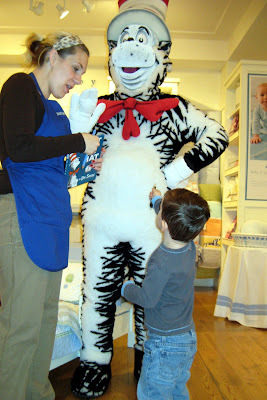 Owen really enjoyed the story and was excited to meet the big Cat. Owen walked bravely up to him and asked for his autograph, then posed for a picture! Yeah! Maybe there's hope for a picture with Santa Claus and the Easter Bunny this year! 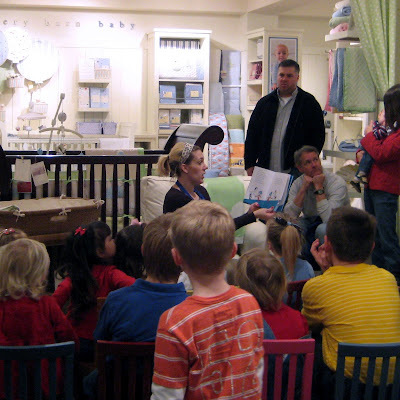 The kiddos listening to the story. 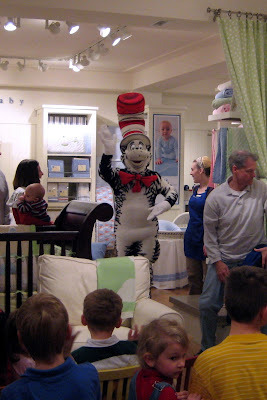 The Cat in The Hat comes out to play! Owen asking him to sign his book . 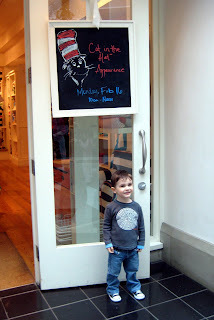 Owen is so tickled that The Cat in The Hat is autographing his book! Posing for a pick with the big Cat! We hope everyone had a great Valentine's Day! Our Valentine's fun started early in the week - coloring Valentine's for friends and family and getting Valentine's Sticker packets ready for Owen's StrollerFit buddies. Also, my friend Aly helped me by making a pair of Valentine's pajama pants and matching headband for my pj party. 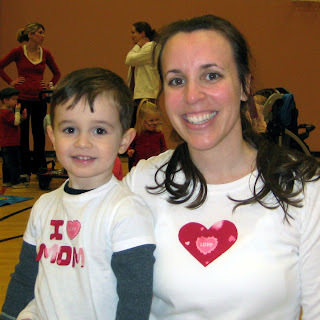 I made matching shirts for Owen and I to wear to StrollerFit! So much Fun! Aaron brought me home flowers on Friday, one of my favorite things. We had a great time hanging out together on Saturday. 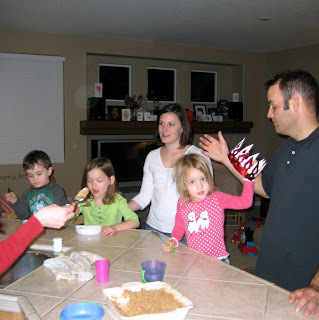 It was a super sweet, super fun family Valentine's Day! 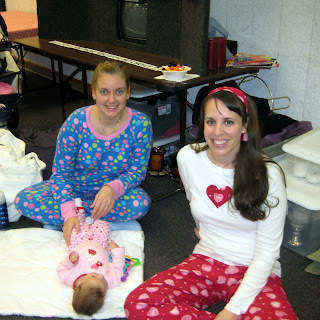 Thursday: Pajama Party at Heart 2 Heart! cute and comfy in their pj's. I got all decked out in Valentine Pj's! All the kiddos had fun exchanging Valentines! 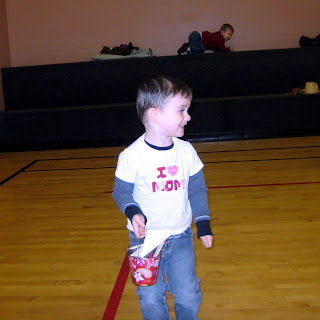 Owen looking cute in his I Heart Mom shirt. Extra cute 'cause we match! 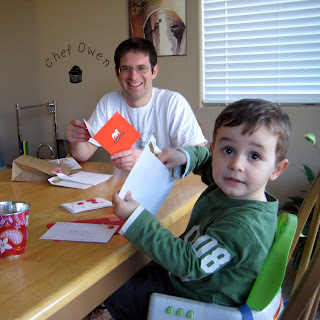 Saturday: Daddy and Owen opening up their Valentine's! 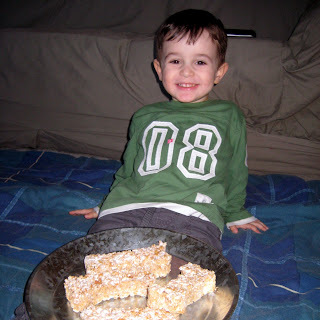 and snack on "Dog Bone" rice cereal treats! We also had spaghetti and meatballs for dinner, just like Tramp and Lady. At Owen's request Aaron and I took turns singing Bella Notte! Below, Owen after dinner, opening more Valentine's loot. Sunday: Heart shaped pink pancakes! Yum! 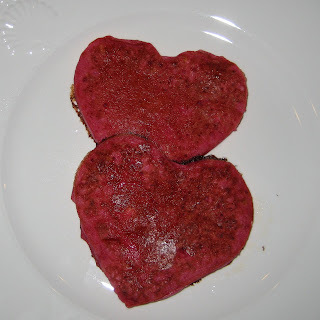 These pancakes get there pink color from roasted beet puree. They also had grated apple and ricotta cheese in them. Thankfully the rain stopped before our team workout this morning. The wind however did not! We were supposed to have our team photo taken but the wind was too powerful. Wendy divided us up into three groups and we did some speed drills before our run. Today we ran two miles. It felt good to get a workout in. Between team workouts I train independently on Mondays and Fridays, walk with Aly on Wednesdays, and consider my StrollerFit classes cross training. Of course I'm very grateful for all the rain we have been getting this week but it hasn't helped me feel very motivated to run on my own. 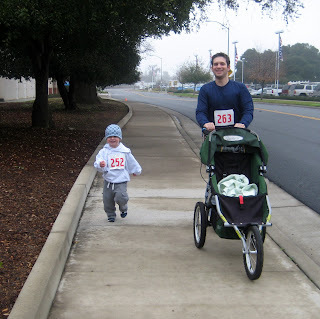 On Monday, Owen and I ran a mile, then did some speed drills. 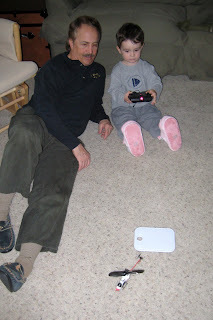 On Wednesday, we went to Aly's house and played with Hailey. Aly made us all blueberry smiley face pancakes! We're starting to brain storm ideas for supporting our Team Philanthropy. My friend and team mate, Natasha (Tasha) Price, is an independent consultant for Taste of Home Entertaining. She has pledged all her personal profit from Taste of Home purchases made now through race day to be donated to NADA, Northern Area Dietetic Association. If you're interested you may view the online catalog and Tasha's website by clicking on the picture below. Success! 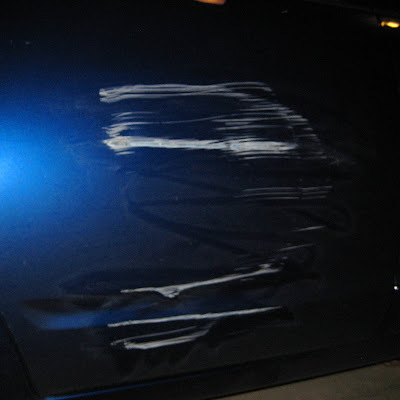 I've tried to post video to our blog before. For whatever reason it hasn't worked. Maybe the video was too long or my patience too short! I'd more or less given up on the idea until a few days ago. 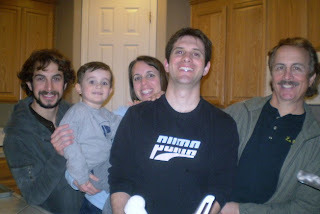 Our friend Tammy posted a video on her blog. It was so much fun to watch I felt encouraged to give it another try! I have Daddy and Dr. Rick to thank for this adventure! It started out as some good ol' puddle stomping and ended with a splish splashing dash through the gutter. Take a look! Owen's boots did a good job of keeping his feet dry but his pants got soaked! Good thing we were able to strip him down and take him inside! Aaron and I have always enjoyed making up silly songs together. Since having Owen it has been even more fun because Owen generally thinks that our songs are hilarious even when they're not really that good! Owen seems to be following in our footsteps! He frequently busts out with little songs of his own. I love them! Today during lunch we were talking about water and being silly. I started singing a silly water song to the tune "If you're Happy and you know it." 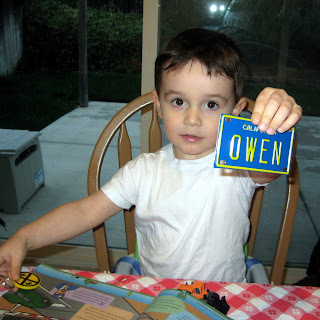 Without missing a beat Owen chimed in with sound effects! So fun! I went on to sing, "If you're hungry and you know it eat some food" and Owen said, "Munch Munch." I almost fell out of my chair laughing!! 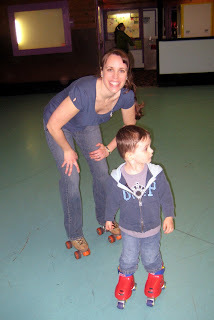 Our Mommy & Me group hosted a family outing at the local roller rink today. On Saturdays there is a Tiny Tot skating session. 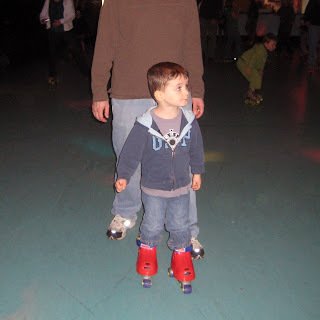 This was very nice for all the little ones and parents, like myself, who haven't skated in years too! Owen was very excited to be going skating. Once we got there though he seemed more interested in the Arcade games. 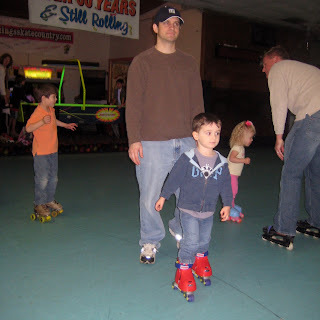 We still had fun skating together and hanging out with other families! 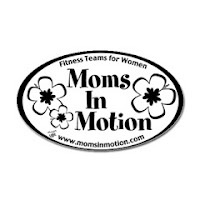 Today was our 2nd team workout for MIM. Unfortunately I did not make it to practice. I did do some running this morning though! Our local running store, The Running Zone, together with the River City Rebels Running Club host a 5k Fun Run Series consisting of 4 runs throughout the year. Today was the first one. 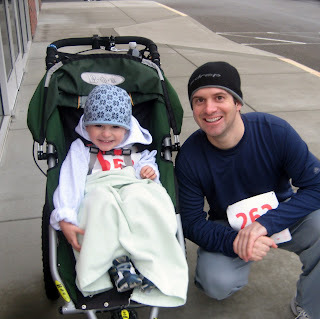 Soooooo Aaron, Owen, and I participated in our first 5k of 2009! We registered Owen because he always wants to run with us and he looks too cute with a racing number pinned to his shirt! Today his time spent out of the stroller was short lived. 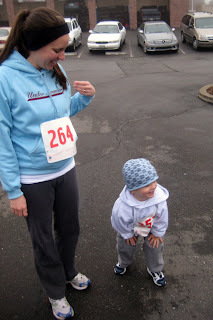 He was very excited to run until the start shot. The loud noise startled him and he had trouble deciding what he wanted to do after that. 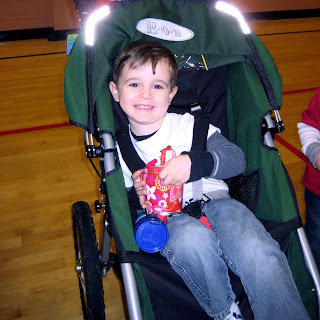 We tried to see if he would recover but ended up putting him back in the stroller. 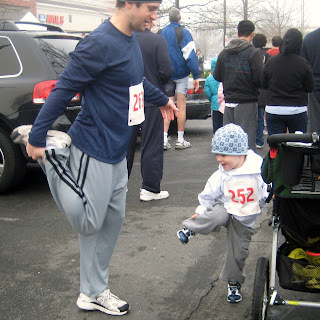 We thought that maybe he would want to run more later on. 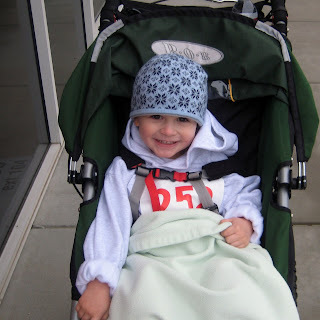 However, as we approached the finish line, he looked way too comfy bundled up in his blanket while munching on a bagel to disturb! Maybe next time! A quick pic before warming up! 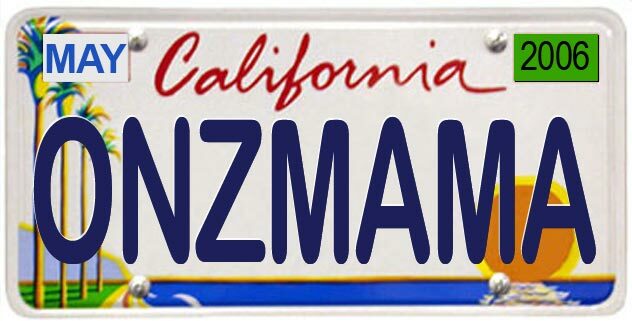 On your mark, get set, gooooo! 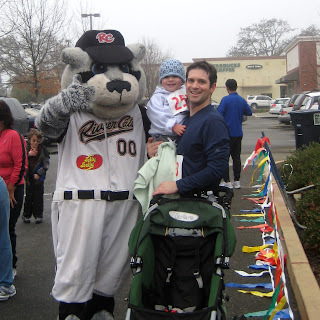 Dinger the Sacramento River Cats Baseball Team Mascot! 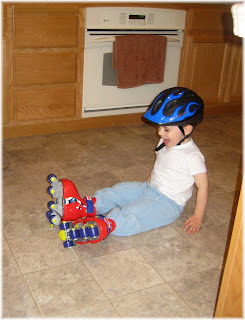 Ever since Owen saw his friends Hailey and Taylor in their roller skates he has wanted a pair. Today they arrived via amazon.com and he was thrilled! 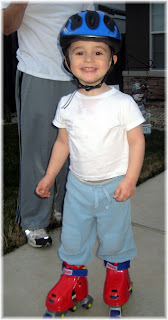 It took three separate "trys" before he actually liked having them on his feet and began to skate. After the first try I thought it would be days before I would get him in the skates again. Luckily it only took a couple hours and by the third try he was outside rolling around! We were so impressed by how fast he got the hang of it. Now all he needs are some wrist guards and elbow and knee pads. Yeah! 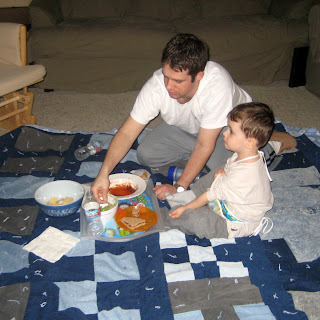 We're not big football fans at our house but there is something about the rest of the country being plopped in front of the television eating endless snacks that makes us want to do the same! 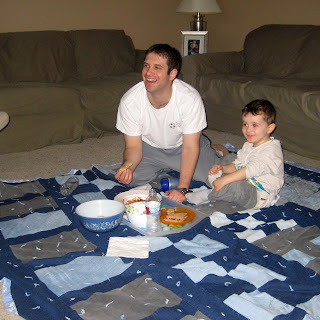 So we decided to watch a movie and throw a blanket on the floor and have a picnic party of our own! Owen thought it was great fun - so did we! Owen was so engrossed in the movie we would have to hold his peanut butter & jelly sandwich up to his mouth so he could take a bite. 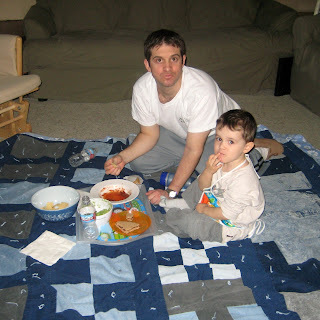 Aaron and I on the other hand had no problem diving into the chips & salsa and guacamole! Happy Super Bowl Sunday everyone.